© Michael Nichols Two mature bulls weigh up their strength, communing head to head. 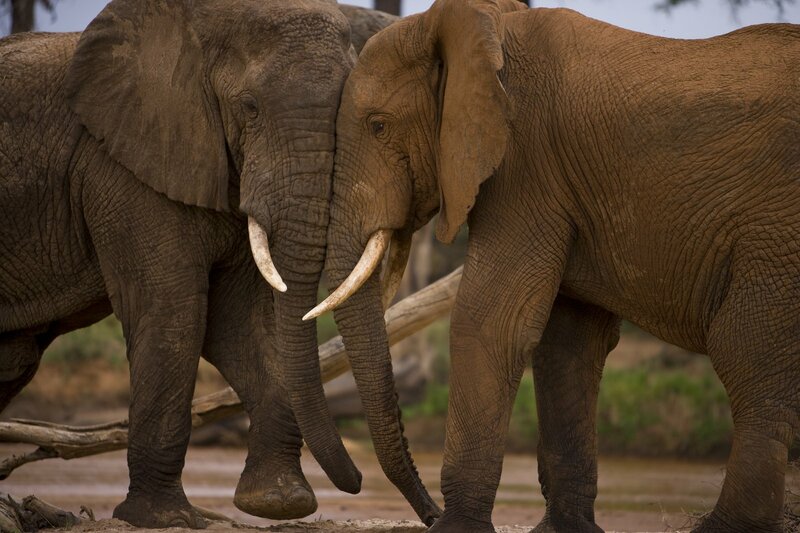 Elephants care for their friends and family, feel emotions deeply, and may even be aware of their own mortality. In Kenya’s Samburu National Reserve, research from Save the Elephants (STE) is revealing new insights into their remarkable hidden world. The series the Secret Life of Elephants was filmed in high definition, and is about our team in Samburu as they follow the dramatic and emotional stories of 500 plus individually known elephants, and reveals the groundbreaking work of the Save the Elephants research team. Spanning two wet seasons in Samburu, the show is co-presented by four researchers from Save the Elephants – Dr. Iain Douglas-Hamilton, David Daballan, Onesmas Kahindi, and Saba Douglas-Hamilton, with guest appearances from Kenya Wildlife Service vet, Dr. Stephen Chege. The most exciting part is the unexpected reappearance of an infamous bull called Rommel. The first time the team came across him was in May 2002 when he was in full musth – a heightened state of sexuality and aggression – and in battle against a well known resident male, Abe Lincoln. When Rommel started to lose the fight he took his frustration out on the nearest “inanimate” object, which happened to be one of the research vehicles. The researchers inside, George Wittemyer and Daniel Lentipo, were extremely lucky to escape with their lives. Rommel has an unmistakable tear (a bit like a half Joker’s smile) in his right ear, so he’s easy to recognise. In all the time he’s been in Samburu the team have only seen him twice, until now. The reserve seems to be at the far edge of his home range and he visits it occasionally when he’s searching for oestrus females. Unfortunately, their sole attempt at collaring him in 2004 failed as his neck was too big for even the largest bull collar, so where he roams in between the rare sightings is a mystery. 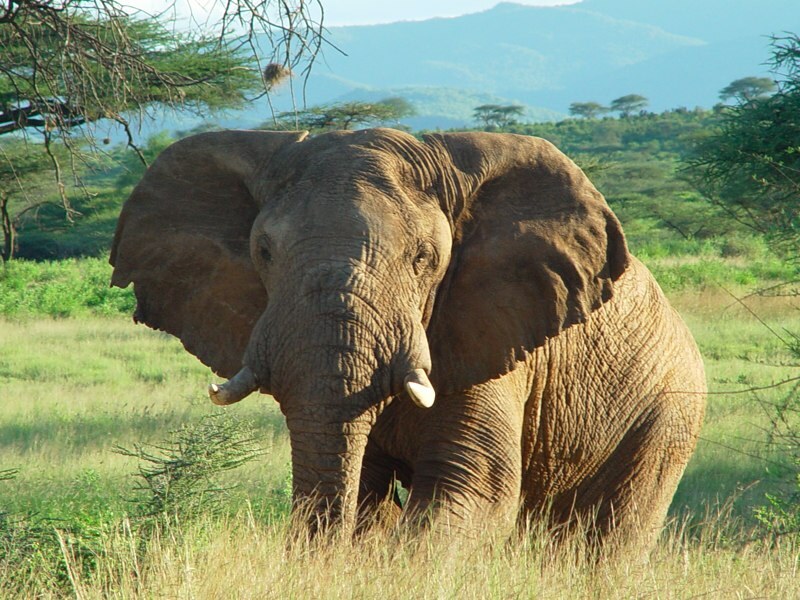 Yet, despite living in an area that is dangerously hostile to elephants, somehow he survives. His latest absence of four years convinced the team that he was dead, but they were wrong. For he’s back – bigger, bolder and badder than ever! The main star of the show is much smaller, a delightful newborn baby called Breeze. She belongs to the Winds family, led by the matriarch Harmattan. In the film we meet her on her very first day of life, see her take her first shaky steps and follow her story through the most challenging nine months of infancy. Her older brother Buster is a bit of a mummy’s boy. Initially he is jealous of Breeze, until his mother teaches him to have better manners. Then, as he starts to gain some independence, he reveals a real talent for getting into trouble. Boys will be boys, everywhere! Bordering the Democratic Republic of Congo (previously Zaire), Uganda, Sudan, Chad, Cameroun and Congo (Brazzaville), it’s fairly unsurprising that Central African Republic has a history of unpredictable politics. The most infamous of its dictators, Bokassa – who crowned himself emperor in the style of Napoleon Bonaparte (said on occasion to feed human flesh to foreign dignitaries) – is now long gone, but the country remains tense and at the time of filming rumours of a potential coup were rife. We avoided the capital Bangui by flying straight from Douala in Cameroun, to a small logging town in the heart of the Central African forest, Bayanga, with a dirt strip that borders Dzanga-Sanga National Park in the southwestern corner of the country. Here, two passionately dedicated researchers – Andrea Turkalo, who studies forest elephants, and Angelique Todd on lowland gorillas – hosted our visit. Veterans of the jungle and committed conservationists, both amused us with horror stories of insect-borne parasites like filaria (which leads to elephantitus), or putze flies whose eggs, laid on wet clothing, hatch into infestations of larvae which burrow into your skin. A tip on removing these revolting worms is to wait until they pop their heads out to breathe then roll out the rest of the body on a matchstick. Inevitably the most common cloth target is freshly laundered underwear, so ironing one’s clothes is a must – but beware of jungle coal irons which should be dipped briefly in to a basin of water to cool before being applied to clothing. I managed to burn a massive hole in the seat of my trousers which didn’t help! Returning to the theme of insects, one of my father’s favourite stories was of a Christian saint who’d pick up maggots as they fell from his suppurating wounds and press them lovingly back into his flesh, saying, “Eat what God hath given thee!” Whilst I’m sure it had its medical upsides, and clearly delighted my father’s wicked sense of humour, I can’t admit to my love of maggots, mango worms, mosquitoes or filaria stretching quite that far. There’s definitely an element of paranoia to one’s first days in the forest, but soon the discomfort recedes into a background of permanent itchiness and you just get on with life. The Ba’Aka people deal with insects and the heat of the jungle by shedding most of their clothes, I often wished we could follow suit as the brush of rain droplets against skin was sweet relief. The most interesting insect event we came across – apart from thousands of communal spiders in a palace of towering webs – was the slow motion horror story of an ant devoured from the inside out by the parasitic fungus Cordyceps. It’s not a nice way to go, but does leave one in total awe of the day to day dramas of life in the forest. In one of the “Babar the Elephant” children’s books the elephant king visits a planet of alien pachyderms. Approaching Dzanga Bai and seeing forest elephants for the first time reminded me of his experience. The burbling sound of these secretive creatures blowing air onto mineral salts in stream beds echoes through the forest until, suddenly, you step out of the tangled vegetation into a very private elephant world. Their vocal range is sensational – ranging across ten octaves – and can slide six octaves in a single scream. 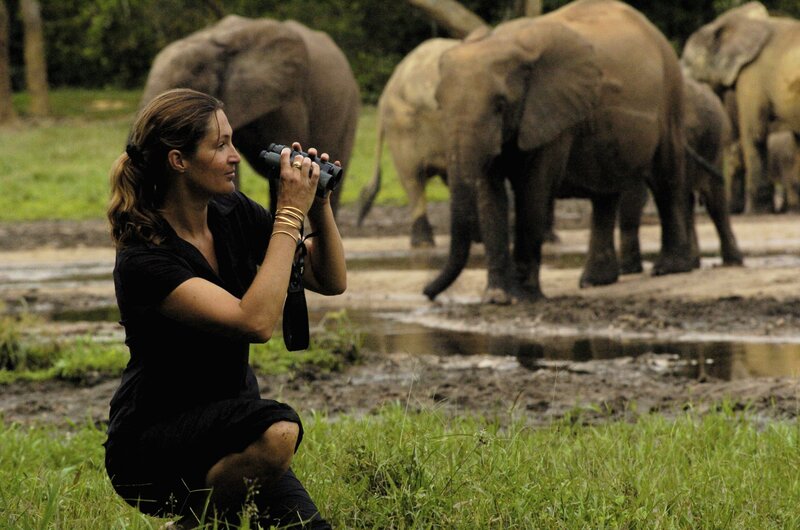 Andrea has recorded infra-sound in forest elephants down to a record breaking 3Hz, which is far lower than the infrasonic range of 20-14Hz in their savannah cousins. The most sobering fact we learned was that forest elephants are highly sensitive to any kind of human disturbance and thus are good indicators of the vulnerability of forest to human exploitation. 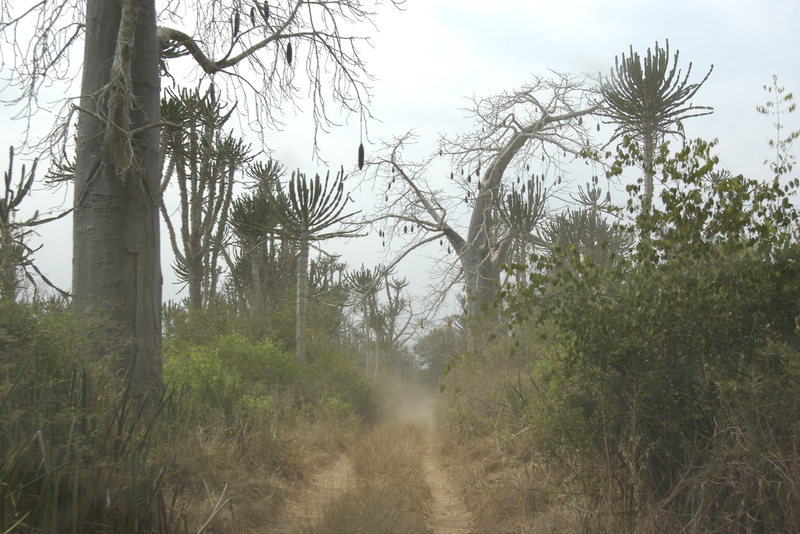 Any track cut into the forest leaves a swathe of human impact up to 50 kms wide on either side of it – snares, logging, gunshots, scarcity of elephants, and a forest that is rapidly emptied and silenced through commercial hunting for bush-meat. We filmed a traditional Ba’Aka hunt of duiker with nets – which is how they’ve always lived in the forest – but I was shocked by the number of Bantu poachers that have invaded Ba’Aka hunting grounds, who use snares and guns and whom we saw daily with poached duiker strapped to their shoulders. Rising demand for hardwoods leads to an increase in logging concessions that are now cross-sectioning the Congo forest, building roads into previously impenetrable areas. Even selective logging has a negative impact, for on the back of increased commerce and access comes growing human settlement and a corresponding demand for bushmeat. Conservation NGO’s are alarmed at the rate of empty forest syndrome where the commercial bush-meat trade is clearing the forest of animal life particularly in Cameroun and DRC, bringing a deafening silence to the great Congo ecosystem. No animal is safe, and we found mangabey, antelope and even elephant meat in the markets. Whilst some logging companies apply strict ethical standards, others have no qualms about clear-cutting forest and wiping out animals. 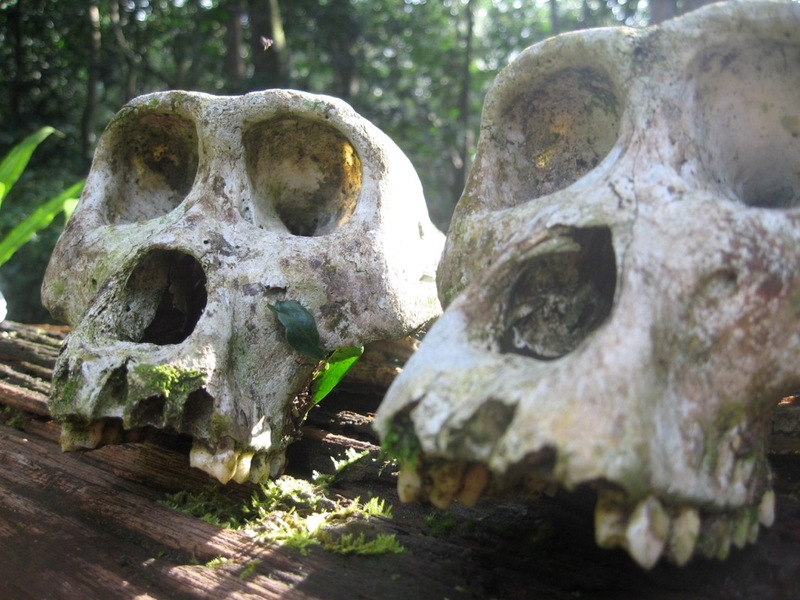 There is also an imminent “protein-crisis” looming due to the upward trajectory of a growing human population, and the forest fauna simply cannot meet the demand. With global warming at the front of our minds, I would urge airlines or large companies needing to offset carbon emissions to buy up logging concessions as quickly as possible and conserve the trees in perpetuity. 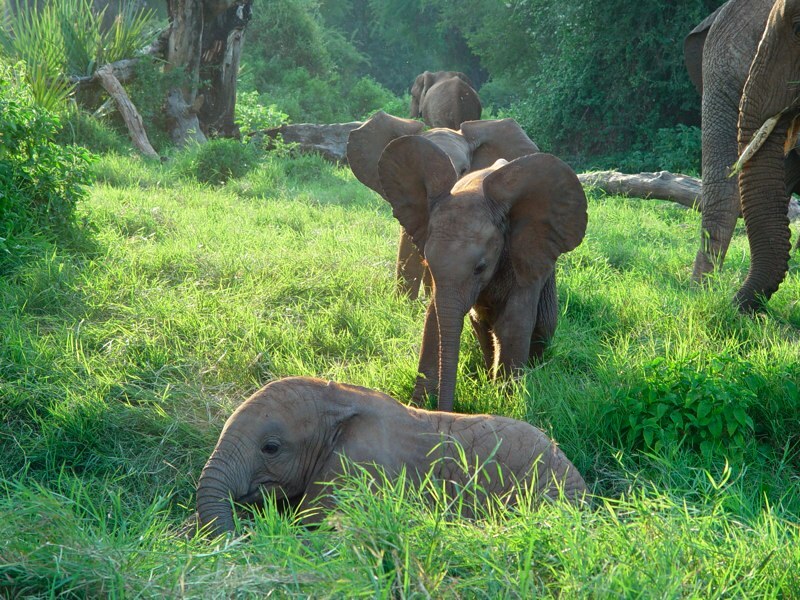 The longer we can keep the Congo forest whole the better, for a sustainable future on our planet. Angola is a jewel of a country that’s been locked in a civil war for most of my life, but since a breakthrough peace accord in 2002 the country has opened up and there’s now a heaven sent opportunity to explore. Sadly, the long years of war have resulted in massive depopulation of both humans and animals and there are vast sections of the country that are still impenetrable. Yet the interface between three extreme ecosystems – the cold Atlantic ocean, the Namib desert, and the Congo forest – is deeply fascinating, and I’ve longed to see how it affects the wildlife. Our journey started at the Cunene river, which borders Namibia, and extended all the way up to Luanda in the north which is not far from the Congo river. Unfortunately the diamond area in the East – where the giant sable is rumoured to be extant – was a no-go-zone as much of it’s still land-mined, so we kept to the west coast and drove on an endless white beach for about 300 km. Racing the tides between dune cliffs on one side and Atlantic breakers on the other was highly exhilarating! But our adventures didn’t stop there – a quick day trip filming marine birds on a deserted island, 10 km off-shore, turned into disaster narrowly averted when our rubber dinghy ran out of fuel only five minutes into our journey back to the mainland. A strong off-shore current prevented us from returning to the island and with sunset approaching we were rapidly losing light. To make it worse, a howling wind was roughing up the sea to white water. Nine kilometers from land and being swept out to sea at night!The sheer horror of realization paralysed us for a moment, but then our crew spirit kicked in and we scrambled for action as a team. We found two ridiculously tiny, useless oars, but then salvation arrived in the form of a small tarpauline which by great good luck I’d brought to cover the camera-gear. We quickly rigged it up as a make-shift sail – attached at the stern to the fully extended tripod, its length was cable-tied to ropes on the bow, and held high above our heads as we took turns acting as the main mast. Progress was agonisingly slow, but our handheld GPS clocked a speed of 4.8 km an hour – it was pitch dark but we knew with certainty we were heading towards land. And life! We sang love songs to keep up our spirits, each thinking of those we’d left at home, “how wooonderful life is now you’re in ma world”. It could have been the start of a horror movie – “Angola Coast, where No One can Hear You Scream” – a small rubber dinghy in high seas, lost in the darkness, overloaded with seven people, no food or water, and drifting out to sea. The stars were brilliant in the sky and we kept on going until, finally, we saw white breakers. Sailing through them we hit the shore just a few kilometers from our camp. Soaking wet and shivering with cold, we danced for joy in a delirious, hugging circle. As the dunes sang around us that night I’ve never felt more clear headed, in love with my husband, and happy to be alive. All credit to our crew who kept their heads and humour, to Tom and Seb who were masts of steel, and to that marvelous little tarp! 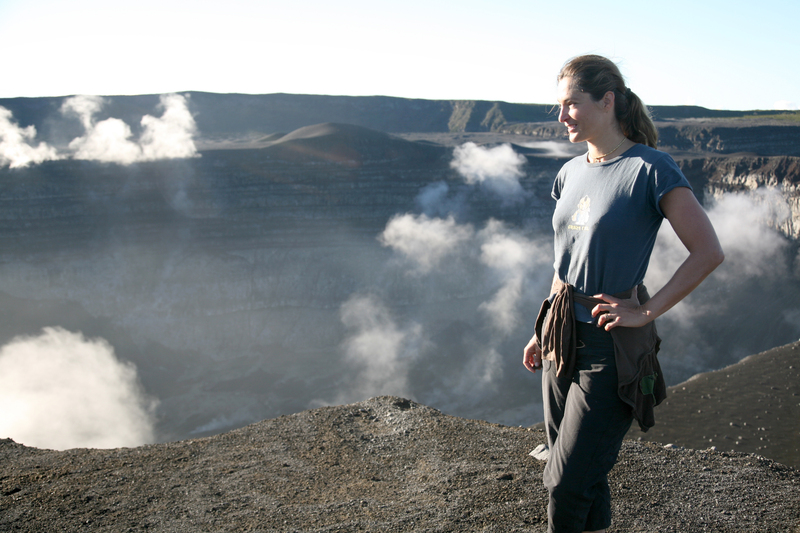 My first job in conservation was with Blythe Loutit in Namibia, who founded Save the Rhino Trust. I was based with her in Khorixas, a small town in the hinterland of the Skeleton Coast, running a crafts for conservation project for the local communities. It became a crash course in desert living as well as a thorough introduction to the biology of desert-adapted black rhino, and certainly one of the most formative periods of my life. Blythe’s enthusiasm was infectious and she knew the desert inside out. One day she let me in to an extraordinary secret about rhino – something that she and her husband had discovered by chance. Then, very sadly, Blythe died in 2005. In her memory I decided to make a film that would record what she had witnessed. I had no idea that it would turn into a four year obsession! Blythe was the finest eco-warrior I’ve ever met, and I can only hope that I had her blessing. Black rhino are solitary animals with an aggressive reputation. But what Blythe had witnessed challenged all of my preconceived notions about them. 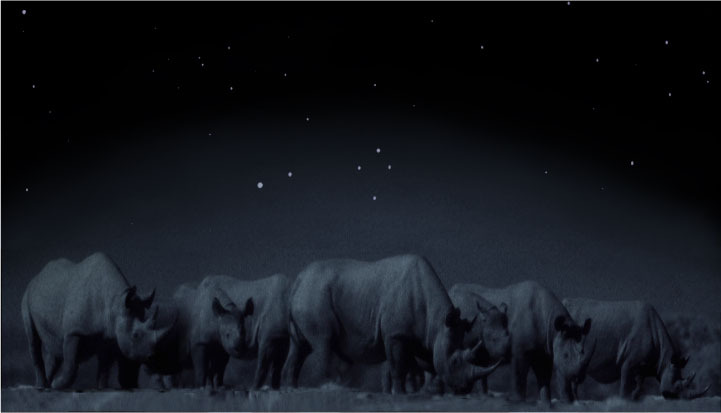 The key to unlocking her secret was to observe rhino at night, so we used a special low-tech “starlight” camera which amplifies moonlight yet allows one to be a fly on the wall. The camera has tremendous depth of field and brings a beautiful silken quality to the images rather like a Chinese painting. Buoyed up by the talents of my wonderful crew we set off to find a hidden location where Blythe had seen black rhino gathering at night to socialise. Our dream was to film this private rhino world for the first time and learn more about them. Despite their size finding rhino in the desert is much harder than expected, and without the help of Simson Uri-Khob and the team at Save the Rhino Trust we would have failed. He took my crew under his wing and walked our legs off to find rhino! It’s thanks to him, Bernd Brell and the SRT trackers that we found any rhino at all. Desert adapted black rhino travel great distances in search of food and water – more than any other rhino in Africa – and when you do eventually catch up with them you’ve got to be on your toes as they have a rather ferocious tendency to charge. There’s something incongruous about a beast as big as a rhino surviving in one of the most inhospitable places on earth, but due to the the low rainfall and unique geology of Namibia, desert plants are super-charged with minerals, so desert-adapted black rhino tend to be some of the fattest rhino in the world. This iconic rhino picture below was taken by my friend and colleague Mike Hearn, Blythe’s deputy director until his accidental death six months before hers in 2005. They’re some of the best pictures of desert rhino ever taken, and my film is dedicated with great love to the memory of both Mike and Blythe. I often wished for Blythe’s guidance during my quest and missed her wisdom sorely, but when we finally found her secret spring and filmed the rhino interacting it felt like we’d discovered a completely different world. Under the cover of darkness black rhino shed their solitary skins to become the social butterflies of the desert. Completely in their element, with senses on full alert, rhino come alive in the darkness. I must admit to there being a few hairy moments as we were working on foot – the first when I was approached by exceedingly curious rhino, and later when a pride of lions commandeered the water hole. The lions slunk off to hunt zebra at the edge of the clearing, but they kept us on our toes all night. It was one of the most extraordinary full moon experiences of my life and as dawn broke I realised I’d learnt one more lesson from Blythe – to peer into this world, learn from it, but then leave it alone so it has a chance to survive. Under the cover of darkness we saw rhino in a completely different light. Known as, Saba and the Rhino’s Secret, in the International version. 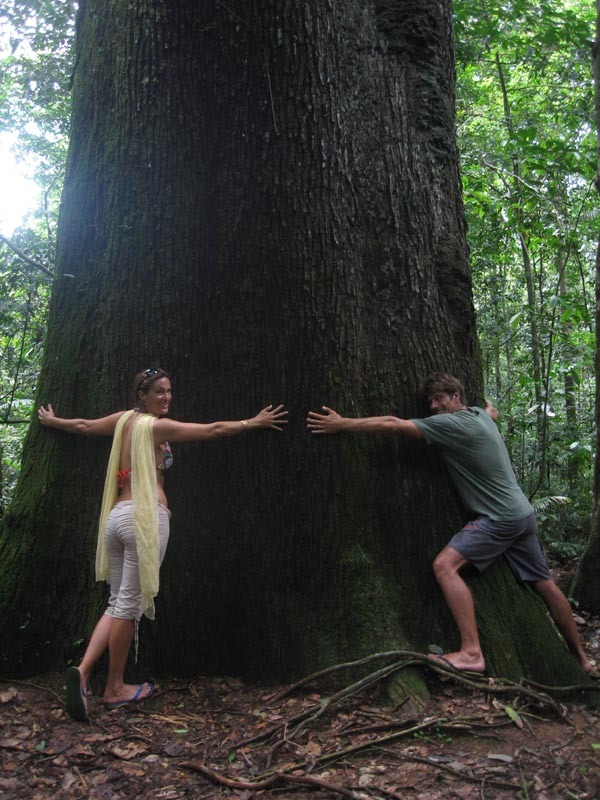 © Frank Pope – exploring the southern part of the Amazon and loving the trees! At long last we’ve gone on honeymoon in Brazil – two years late, but it’s heaven! With the Amazon basin to explore, the madness of carnaval in Salvador and the possibility of riding on horseback with the indigenous cowboys of the Pantanal, this is the one place I’ve wanted to come all my life. Yet for some reason my father took against it, and in my teen traveling days I was forbidden to go. I think he was afraid that if I went to Brazil I’d never come back, and in hindsight he was probably right! Then life and work got in the way … but now that I’m safely married with a wonderful husband as company, there’s no stopping us. At the edge of the Amazon near Alto Floresta we took a small boat to Cristalino Jungle Lodge up a black water tributary, several degrees cooler than the milky tea “white” of the main drag – every second is a metre further into untouched forest – gusts of cool air, birds skimming the water surface, and trees cascading over the banks. We’re told it’s safe to swim despite the piranhas! Apparently they only attack if they’re trapped in small pools of water and are very hungry. 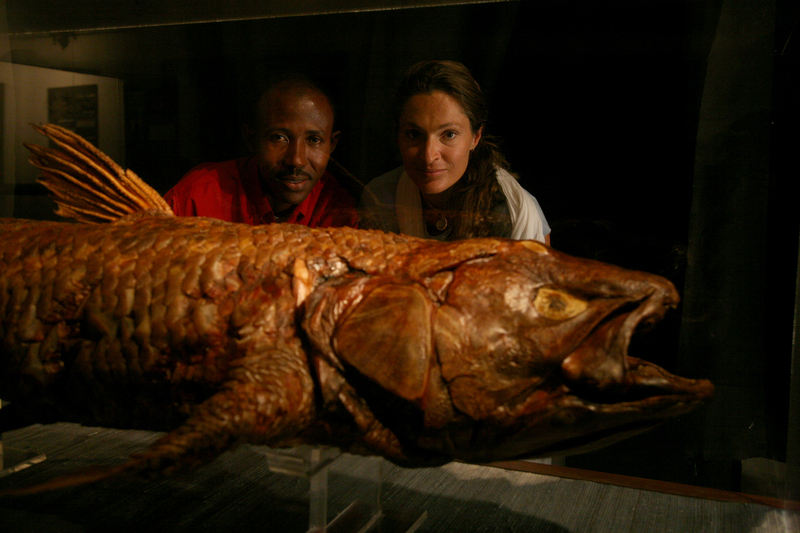 When you open your eyes underwater it’s like swimming through blood – an effect of the tannin run-off in the soil. I resurface panting in fright, my mind running riot with things that will eat me – monster-fanged dorado, electric eels, caimans, piranha and those nasty little fish that swim up into your bladder. But due to the alkalinity/acidity of the water this aquatic ecosystem is very different from the white rivers and curagiu aren’t found here. Every day we ask to be dropped off way upstream and then float slowly back to camp in inner tubes, swimming in the black water for hours, and drifting silently to spy on caimans, saki monkeys, spider monkeys, red-handed howlers, brown capuchins, and colourful bursts of toucans and macaws that flash through the trees. Definitely the best swims of my life. On the last night we sleep up in a tree-hide, enthralled by the song of the forest, then hear the splashing footsteps of a tapir beneath us. Pure magic. The trees are magnificent – we taste edible saps and the bitter bark of quinine. 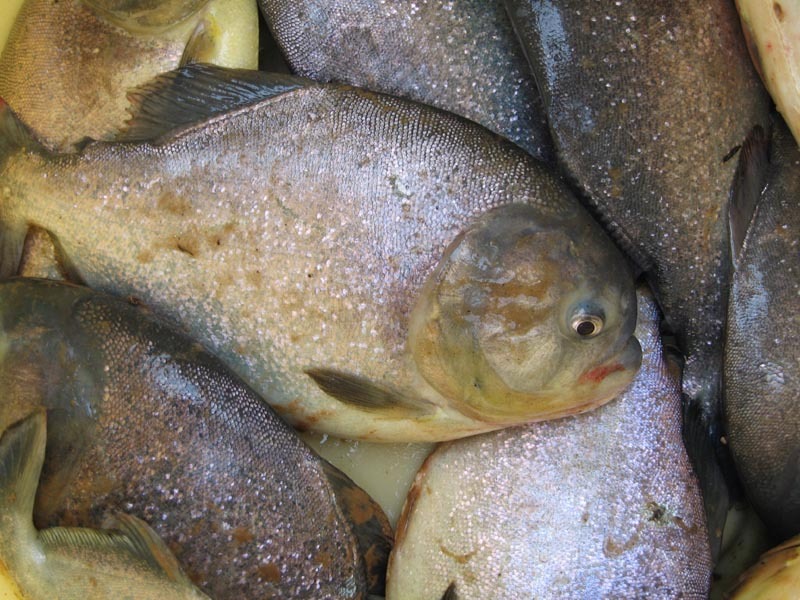 The only piranha we actually come across are those served up for dinner in the Pantanal. Our hosts, genuine Pantaniero cowboys, have set up the first indigenously-owned Jaguar Lodge, rapidly gaining a reputation as one of the best places to see jaguar. But the mosquitoes in Nov/Dec are horrendous, so beware! 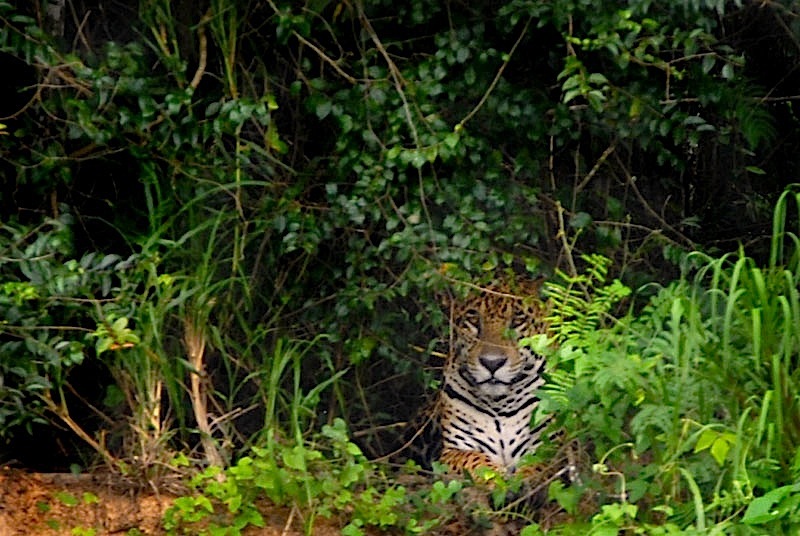 Mozzies aside, the area is redeemed when we explore the Cuiaba river and soon come across a beautiful male jaguar on the river bank simply watching the world go by. What more can I say! After the many years I’ve spent filming big cats in Africa, meeting this jaguar took my breath away. It was the absolute highlight.